Hudson Lane really doesn’t need more eateries. Unless it’s something other than coffee and cakes. Now hear this: A new place is indeed opening tomorrow and it’s inspired by the quintessential gypsy spirit. Meet Dum Maro Dum, a peppy new lounge that’s opening its doors this Friday and already going all out on the decor and theme. From the tiny peek we got, we saw a whirlwind of trippy colours with a whole lot of neon, wall art and posters. The idea, they say, is to call out to the inner gypsy in each one of us… They’re wise enough to acknowledge that we’re basically all reluctant adults trapped in a business suit when we’d rather be chasing rainbows and fireflies. 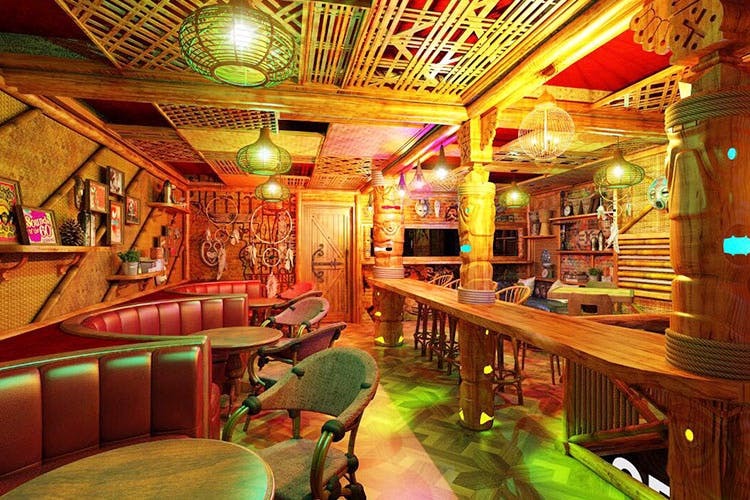 Dressed in psychedelic hues, this new restaurant is a celebration of all things retro. This is probably why we see Zeenat Aman along with a Summer Of 69 – a strange concoction of everything that makes us sit back and really chill out. In keeping with the general tone, the servers will also be wearing drug rugs and crazy wigs. The menu will be a multi-cuisine spread and the music will shuffle between Bollywood and retro hits. So, get that floral tiara out along with a pair of flipflops. Gotta go on the weekend to celebrate peace, love and unity? Yes? Or yes?